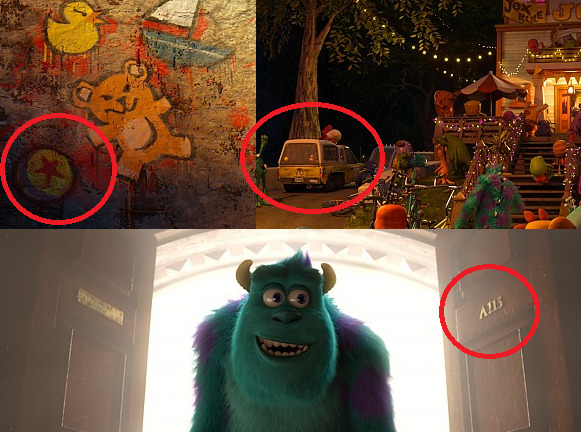 One of the things fans really geek out on when it comes to Pixar movies are the little Easter eggs (or "hidden gems," as they're known around Pixar) they drop into the background of scenes. Whether they're paying homage to the origins of Pixar itself (A113) or keeping a tradition alive that began with its first feature Toy Story (the Pizza Planet truck), each Pixar movie is full of these sorts of nods to its past, present and future. The Easter eggs in Pixar movies have become so popular that fans will watch the movies over and over in a race to discover -- and then share -- all of the little cameos included within. We wanted to know more about what this Easter egg process was like over at Pixar. Is it as important to them as it is to us? Is there a specific time where everyone gets together and throws out their ideas, or is there one designated person who's, like, an Easter egg technician in charge of finding places for all the notable Easter eggs? We asked Monsters University director Dan Scanlon and producer Kori Rae to break it down for us. "It's so not scientific," Scanlon said, alluding to the fact that fans seem to take these Easter eggs way more seriously than Pixar. "Literally, the crew members all know about it now, so they'll come up at different times," Rae added. "They'll just pitch ideas, like we'll be in an art review and someone will go, 'Oh look, it's the Luxo ball!' and everyone says, 'That's great!'" The inclusion of the Pizza Planet truck is one of Pixar's most famous Easter eggs, having first appeared in Toy Story and then in every Pixar movie since except for The Incredibles. With such an important cameo, you'd think the decision of where to place the truck in each movie would be an important one, but not so says Scanlon. "Yeah, we'll be sitting there in a scene and somebody will say, 'Hey, we can put the Pizza Planet truck here,' and you'll go, 'Yeah that's a good place for it.' And that's it." To show you how relaxed they are at Pixar when it comes to their Easter egg process, there was one little familiar cameo that they had forgot to include in the movie. It was only after a journalist asked about its appearance in Monsters University before they realized they had to go back and put it in. "Early on in the process a journalist asked us about the Luxo ball, and we realized we hadn't done that one yet," Scanlon admitted. "So we quickly went back and found a spot for it." "[The whole process] is actually less scientific than you would think," Rae added. While they didn't add many Easter eggs to Monsters University on top of the classic ones like the Pizza Planet truck and the Luxo ball, Scanlon did admit there were a few personal addresses thrown in there as well. In terms of his favorite, that particular cameo was an easy one. 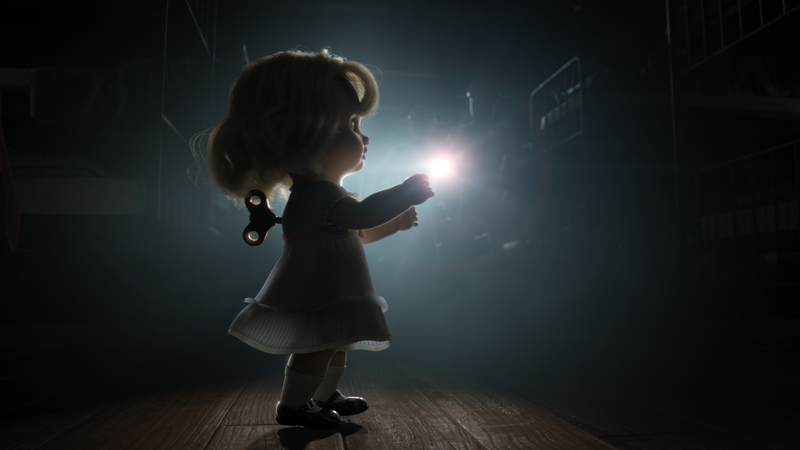 "The A113 one was fun because we got to include it as the classroom [for Scaring 101], which is how it all originally started. It was the animation classroom for a lot of those guys, like John [Lasseter] and John [Musker], so it felt like a great way to bring it full circle." To celebrate the hidden gems that Pixar sneaks into its movies, here's a brand new one from Monsters University that we're lucky enough to premiere, and we bet you had missed it entirely while watching the film in theaters. Can you spot the reference? Yup, that's Big Baby from Toy Story 3 roaming around the kids' cabin towards the end of the film. 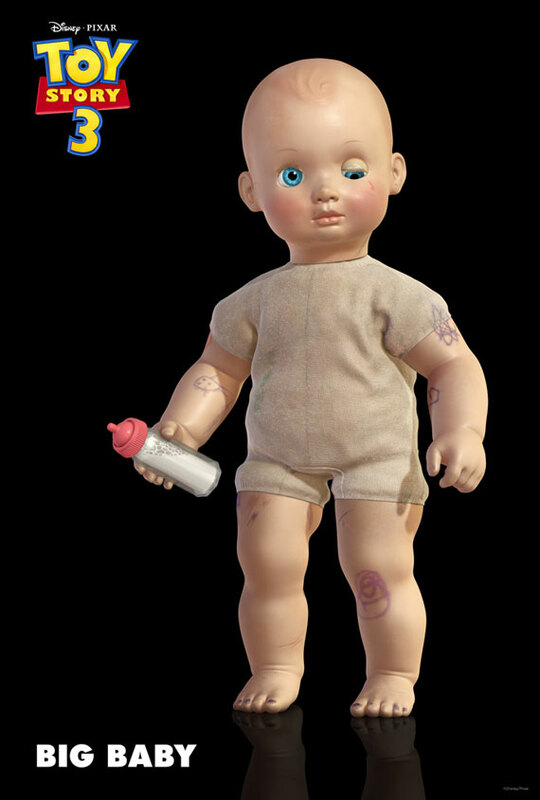 This is actually what Big Baby looked like before she was discarded in Toy Story 3. 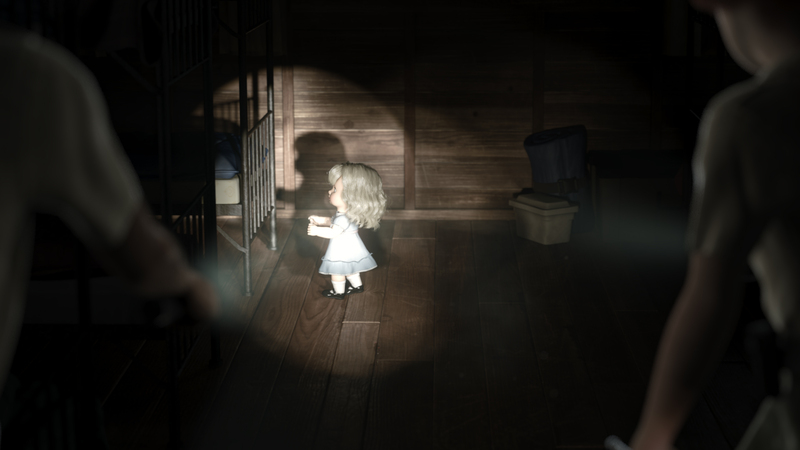 She had hair and wore a dress, and somehow found her way from this cabin to Sunnyside Daycare, where we meet her all disheveled and full of tats in the last Toy Story installment. So not only is Monsters University a prequel for the Monsters, Inc. characters, but in a way it's also a prequel for the Toy Story 3 characters, too! Monsters University hits DVD/Blu-ray on October 29. We'll have more from Scanlon and Rae in the coming days.